Scientists at the Georgia Institute of Technology have shed some new light on perovskite-based semiconductors that suggest they are quite unlike established semiconductors that rely upon rigidly stable chemical foundations. The researchers were looking at hybrid organic-inorganic perovskites (HOIPs) and discovered that semiconducting physics created what could be described as electrons dancing on chemical underpinnings that wobble like a funhouse floor in an earthquake. "We don't know yet how it works to have these stable quantum properties in this intense molecular motion," said first author Felix Thouin, a graduate research assistant at Georgia Tech. "It defies physics models we have to try to explain it. It's like we need some new physics." This movement has made HOIPs challenging to examine, but the team of researchers from a total of five research institutes in four countries succeeded in measuring a prototypical HOIP and found its quantum properties on par with those of established, molecularly rigid semiconductors, many of which are graphene-based. "The properties were at least as good as in those materials and may be even better," said Carlos Silva, a professor in Georgia Tech's School of Chemistry and Biochemistry. Not all semiconductors also absorb and emit light well, but HOIPs do, making them optoelectronic and thus potentially useful in lasers, LEDs, other lighting applications, and also in photovoltaics. Commonly, semiconducting properties arise from static crystalline lattices of neatly interconnected atoms. Despite HOIP's wobbling, it's also a very ordered lattice with its own kind of rigidity, though less limiting than in the customary two-dimensional materials. "It's not just a single layer," Srimath Kandada said. "There is a very specific perovskite-like geometry." Perovskite refers to the shape of an HOIPs crystal lattice, which is a layered scaffolding. "The lattice self-assembles," Srimath Kandada said, "and it does so in a three-dimensional stack made of layers of two-dimensional sheets. But HOIPs still preserve those desirable 2D quantum properties." "At room temperature, the molecules wiggle all over the place. That disrupts the lattice, which is where the electrons live. It's really intense," Silva said. "But surprisingly, the quantum properties are still really stable." "One of the compelling advantages is that they're all made using low-temperature processing from solutions," Silva said. "It takes much less energy to make them. With this stuff (HOIPs), you can make big batches in solution and coat a whole window with it if you want to." 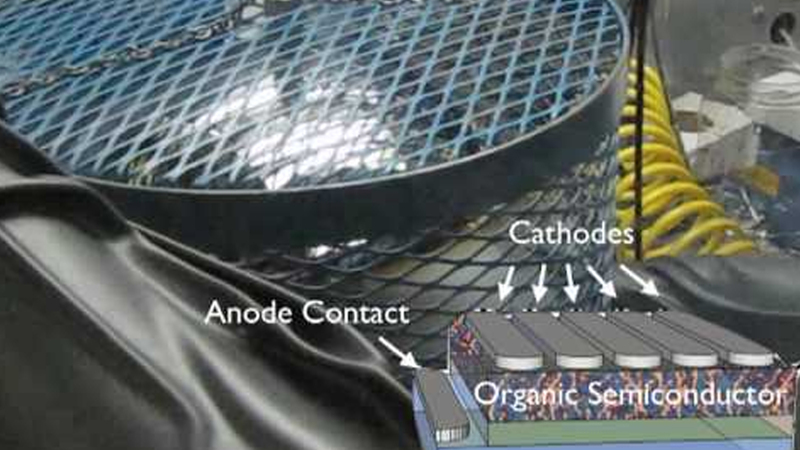 HOIP chemical lattices, like all semiconductors, are configured to share electrons broadly. The researchers describe the electrons and holes in the HOIP systems as racing around each other like dance partners, pairing up to form 'excitons'. "In this material, we found that the biexciton binding energies were high," Silva said. "That's why we want to put this into lasers because the energy you input ends up to 80 or 90 percent as biexcitons." "You can adjust the chemistry (of HOIPs) to control the width between biexciton states, and that controls the wavelength of the light given off," Silva said. "And the adjustment can be very fine to give you any wavelength of light."